Cracking open the last closed platform: the TV. A beautiful, affordable console -- built on Android, by the creator of Jambox. We've packed this little box full of power. Developers will have access to OUYA's open design so they can produce their games for the living room, taking advantage of everything the TV has to offer. Best of all, OUYA's world-class console, controller and interface come in one beautiful, inexpensive package. UPDATE: Our Kickstarter campaign is over, but you can still get an OUYA. Head over to www.ouya.tv for more info and to place an order. Still not sold on this, but it's an interesting thought. It just doesn't seem to be as innovative as it's trying to make out. And especially when their largest push on marketing is bringing gaming back to the TV - uhh.. what's stopping that now with every other platform? We'll see, it's nice to see something new trying to float the market, but it just doesn't strike me as that special. The innovation comes from the fact that it's open source. 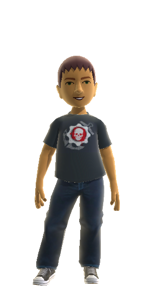 Anyone can develop for it with minimal loops to jump through, a big complaint smaller dev teams have with XBLA & PSN. This isn't going to do anything that you can't already do by connecting a PC to your HDTV, but the low cost ($100 US) and convenience of a dedicated open source media box for your TV may give it staying power. Ouya raised over $8.5 million via Kickstarter, breaking Double Fine's record in the process. Time will tell if the investment pays off. Personally, I'm optimistic, but I'll wait until after it releases before I consider buying one. The real deciding factor for me personally is the software I can enjoy on the Ouya console. Minecraft is already supposed to be coming to it, but let's hope for some other big names to get games on it. Wiki has a list of confirmed & unconfirmed titles. And of course add whatever games are available on OnLive. But as I mentioned above, nothing that I can't already play with a PC connected to my TV. Exactly as you guys say, whether this is a success is based on who goes for it. Open source, to me, doesn't make it innovative since PCs have had that for so long now that it's stopped being a big deal. Though, I took a step back and looked at this again and I think my issue is I'm looking at it "wrong" - for someone who either doesn't have a PC or feels less comfortable gaming on it, it bridges the gap between PC and Console, removing the constraint of licenses that XBLA etc. will throw at you. I hope it's a success for that alone, but I can't see myself wanting one. My biggest curiosity is how they deal with the ports that look like they'll appear from mobile/tablet games being used on it. Those games are created around a very specific resolution knowing that they can make a game look beautiful on modern smartphone screens or the iPad etc. but those won't instantly convert into beautiful looking games on a TV using something like this. Developers probably won't want to just create their games around the larger res. and cut them down for their mobile counterparts initially, but the overwhelming support this has through kickstarter might just get enough people signing on from the industry. As I say, I'm still hopeful for the project! ...And the kickstarter conversation has reminded me of something I'll now post. I'm saving up for the future "DOH!" "We will be a part of any console launch in the future," GameStop CEO J. Paul Raines told Joystiq this morning, when asked about GameStop's interest in stocking theOuya console. Though he was clear to note that the company did not have an official announcement regarding any potential plans to carry the Android console, Raines was positive about the device. "We think Ouya's cool. We love the idea of open-source components. Everything we've read is great." Raines related the new console to the Google Nexus 7 tablet that GameStop sells - and that Raines turned on during our conversation in order to remember a game he wanted to talk about (It was Dead Trigger.) "Here's the exciting thing that's happening: if you look at the power of the processor like the Tegra 3 or the x86 stuff that's coming on Windows tablets, you've got a processor now and graphics capability that are really exciting," he said. "There will be games developed for that stuff. So you're going to see more of these open source type products, and we will be right in the middle of all of it." Good for OUYA. I hope they strike a good deal with GameStop. Main reason is that it's wide open. Add to that, all the Android apps, as well as the potential for low priced AAA games. Yes the PS3 & xbox will have higher budget games, but they cost so much more. This console will appeal to retro fans, and those looking for cheap, but decent entertainment. OUYA Dev Consoles are on their way to 1200+ Devs around the globe! 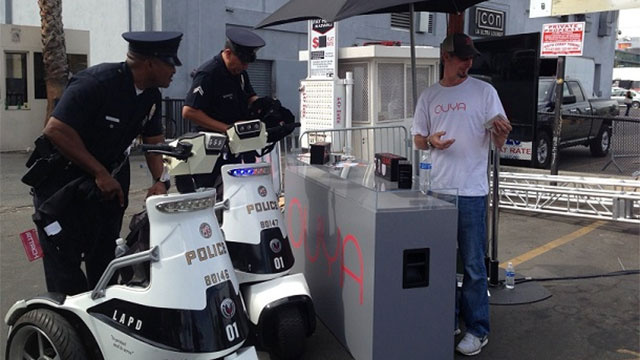 Some background : Ouya console developers have been sparring with E3's organizers, the ESA (Entertainment Software Association), and apparently today, the LAPD. Ouya team sets up in parking lot opposite E3. Ouya team retaliate by renting out the spots in front of the trucks, erecting big OUYA banners. ESA respond by calling the cops, trying to get Ouya's booth shut down. ESA rents out parking space in front of the Ouya booth, parks huge trucks in there, obscuring the Ouya booth.